ປ້າຍ ອ່ວຍພອນ "Merry Christmas" ສ່ວນໃຫຍ່ ແມ່ນຈົມນ້ຳ ທີ່ໄຫຼຈາກ ແມ່ນ້ຳ ຢູ່ Pea, ວັນທີ 26 ທັນວາ 2015 ໃນເມືອງ Elba, ລັດ Alabama. ທ່ານ Tanager Tyler ແລະ ລູກຊາຍ ທ້າວ Mitchell ເບິ່ງລົດຄັນໜຶ່ງ ທີ່ຕົກຢູ່ຂອບທາງເຂົ້າເຮືອນຂອງ ພວກເຂົາເຈົ້າ ຫຼັງຈາກນ້ຳໄດ້ພັດມັນ ອອກຈາກທາງ ຕົກຢູ່ທີ່ແຫ່ງນັ້ນ ພ້ອມດ້ວຍຜູ້ໂດຍສານ ແລະຄົນຂັບ ທັງໝົດ 4 ຄົນ ໃນເວລາຄ່ຳຄືນມື້ກ່ອນໃນເມືອງ Pinson, ລັດ Ala., ວັນທີ 26 ທັນວາ 2015. ປະຊາຊົນສອງຄົນ ຟ້າວແລ່ນ ຫລົບຝົນ ໃນຂະນະທີ່ ມີສຽງສັນຍານ ເຕືອນໄພ ເຖິງພາຍຸຮ້າຍແຮງ ຈະພັດຜ່ານ ໃນກາງນະຄອນ Dallas, ວັນທີ 26 ທັນວາ 2015. ລັດຄາລີຟໍເນຍ ໄດ້ປະສົບກັບສະພາບແຫ້ງແລ້ງ ໃນໄລຍະ 4 ປີຜ່ານມາ. The United States is battling unusual post-holiday weather, causing death and destruction across large portions of the country. Several tornadoes struck the southern state of Texas after dark Saturday, leaving at least seven people dead and destroying homes in the Dallas area. The Weather Channel said the severe weather is a result of Winter Storm Goliath emerging from the western U.S. and interacting with the record warmth across much of the southern U.S.
Parts of Texas and neighboring Oklahoma are also bracing for what could be a crippling blizzard with as much as 45 centimeters of snow. 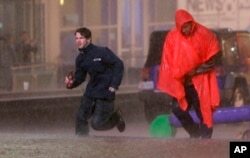 The unusual weather conditions have killed at least 10 people in Mississippi.Several others have died in recent days from powerful tornadoes in other parts of the south.Flash flooding conditions have closed nearly 200 roads across Alabama and trapped motorists in their cars. In California, more than 600 fire fighters are battling a sprawling brush fire that has burned more some 500 hectares.Officials say the fire is now 60 percent contained. California has been suffering under drought conditions for the past four years. Meanwhile, the U.S. eastern coast is experiencing unseasonably warm weather.Some New Yorkers wore shorts around town Christmas Day, but needed a jacket by Saturday.The temperature Sunday is expected to climb back up to unusual warmth for December.Washington could reach record highs for the day.